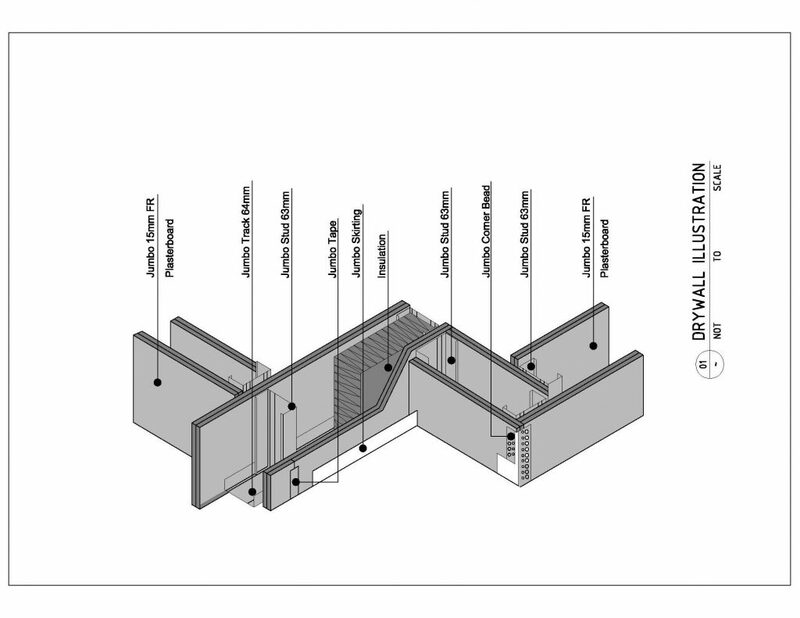 Our range of JUMBO Drywall partition systems and Econocoust Ceiling systems are designed to meet the acoustic conditions required while being robust and easy and fast to install, using the minimum number of components. Our acoustic solutions have the design and performance flexibility to accommodate these differing requirements without compromise on installation or layout efficiency. The optimum acoustic climate will be obtained with the right combination of sound absorption and sound insulation, and can be supplemented by the use of active acoustics. Econocoust acoustic ceiling tiles facilitate the acoustic functionality of a suspended ceiling by providing a range of tiles with varying NRC values (noise reduction co-efficient) which allow for both absorption and reflection of noise. The higher the NRC the greater the absorption of noise which reduces the overall noise levels and lowers reverberation, creating a more comfortable and productive working environment. It is however important to understand the requirements of the acoustical space, in order to correctly select the best acoustic tile option. In a lively bar or restaurant more reflectance of noise may be the objective and an NRC of 0.50 may be more suitable. There are a number of reasons that high levels of environmental noise are becoming critical. These include increasing population and population density, increasing volumes of road, rail and air traffic and for extended periods, and increased intrusion into commercial and industrially zoned areas. The effects of excessive noise levels in homes and offices have been widely researched. They include annoyance, anger and frustration, and they have been linked to health problems such as loss of sleep and sleep quality, heart disease, hypertension and psychiatric disorders. For these reasons, designers should carefully consider the products and systems used in houses and commercial office space with regards to their acoustic performance. Our JUMBO AcousticWALL 63/120/S56 was tested and received an excellent sound rating of 56 RwDB, one of the highest sound ratings in it’s class.